1) Basically Herman is telling us that we each both break hearts and have our hearts broken during our lifetime. Do you agree? I do agree, I think you will have your heart broken over something at some point and you will somehow break someone's heart even if you do not mean to. 2) He implores us to take his advice. Have you more recently given or received advice? I was asked for advice this week, not sure how much help I was though. It was a sensitive topic. 3) Herman's real name is Peter Noone. He was popular with girls because of his bright, toothy smile. How's your oral health? When are you due to go to the dentist? I believe I go again in January. We go every 6 months to have our teeth cleaned and we have any cavities fixed at that time. 4) Peter/Herman got married on his 21st birthday. That's one way to make sure you don't forget your anniversary. Do you have a good memory for anniversaries and birthdays? no! I am the worst! I have to write them all down to remember. I do like facebook for helping me remember friend birthdays. 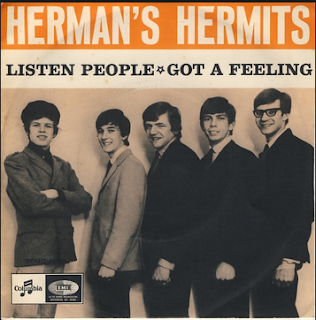 5) Between 1965 and 1971, the Hermits worked very hard. They appeared on all the major TV shows of the day, recorded albums, made a movie and then criss-crossed the United States and the United Kingdom, performing live. After those six years, Peter decided he'd had enough and left the group. Have you ever felt burned out and ready for a change? Yes, before I changed jobs, the school I was working for was odd. It stressed me out. It was a unique situation, it was a co-op and not a school district, so I was on my own to figure everything out. Not a great place to thrive. 6) In 1966, when this song was popular, the miniskirt took the fashion world by storm. What's the most recent piece of clothing you added to your wardrobe? probably a school t-shirt. 7) In 1966, TVs were expensive pieces of furniture. A set with a 16" screen and a wood console sold for $250, which is $1,950 in today's dollars. Tell us about your TV. How big is it? Where did you buy it? We have a 50 inch flat screen smart tv we bought at Best Buy. TV's do not cost much anymore. We bought my mom and dad one for Christmas one year. 8) David Schwimmer, aka Ross on Friends, was born in 1966. Who was your favorite Friend? Rachel, I always loved her hair and her style. I am close in age to the actors in the cast of Friends. 9) Random question -- Describe your dream car. I do not really have a dream car, I just want a new car. I own a Toyota Camry...GREAT car. It is a 2001 and still drives great...no problems. I would keep it, just want a newer model too. I probably will not do that, so I will keep my older Camry. They run forever! Hello Lori, I'm visiting from Treasures By Toni! I enjoyed reading your answers and I agree with you about the car, if it still runs good hang on to it a while longer! Happy Fall ! Thanks for visiting my blog today! I enjoyed reading your answers to this week's Saturday9. Nice to meet you! I love my Camry, too. This is my second one. The first one was a 2003 and I would still be driving it except it developed an issue with the door locks - they would lock and not respond to the key fob or to the key, for that matter, and it became a safety hazard. So we traded for a 2014 model that had been on the lot for 5 months and was on sale cheaper than a used one! I don't know why it didn't sell, it is a great car. I expect to drive this one at least another 6 years or more. I also am close to the age of the cast of Friends--but Joey is my favorite (at least today he is). Well, I'd say you have gotten more than your money's worth out of your Camry. Good for you! Cars really do last a whole lot longer than some folks know, such as my husband. :o)) He pretty much buys a new car every 5 or so years. But, he does have a 26 year old Chevy Blazer that doesn't even have 130,000 miles on it. Go figure! Good to know about the Camry since I have one these days. Yes, that birthday reminder on Facebook has been a godsend more than once! The advice you gave out... it was never a waste to help someone even if you just listen it is better than some get. I am sure whatever it was about you offered the best you could. We have Toyotas here and they are good cars. I agree that they do last forever. Enjoy your weekend! My last Toyota I had 127,000 miles on it and all I did was routine maintenance.